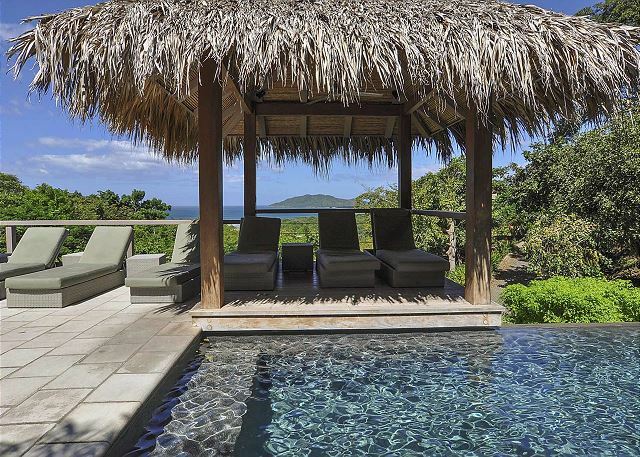 Remodeled in 2015, Villa Paradise is a luxurious 3 bedroom, 3.5 bath vacation Villa with a breathtaking view of the Pacific Ocean as it stretches into the horizon. 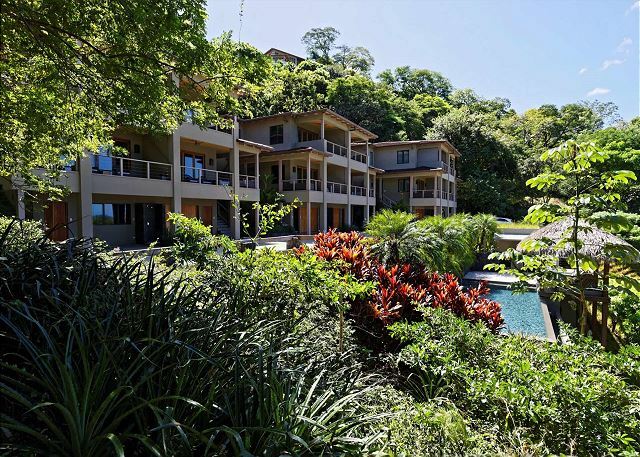 This Villa is one of the 6 luxury homes that compose Villas Las Mareas, a hillside paradise located in an exclusive gated community that sits above the northern end of Tamarindo beach, overlooking the vast expanse of Playa Grande and Las Baulas National Marine Park. On the beach in front of Villas Las Mareas are the waves that make Tamarindo an international surf destination. This gorgeous home, measuring over 2,000 square feet, features a spacious, elegantly furnished living room complimented with a large LED flat screen TV optimized with sound bar, La Cantina floor-to-ceiling windows, and generous terrace. The Gourmet Chef’s kitchen is fully furnished with stainless steel Bosch appliances, induction stovetop, quartzite granite countertops and top quality Cuisinart cooking equipment. The designer dining table comfortably seats up to 8 guests. 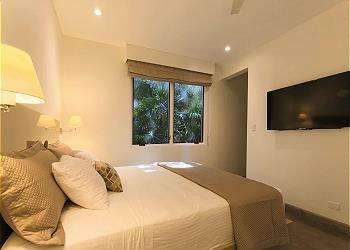 Each bedroom is furnished with a king sized bed and orthopedic mattress, an LED flat screen TV, an individual safe and an in-suite bathroom with elegant travertine tiles. 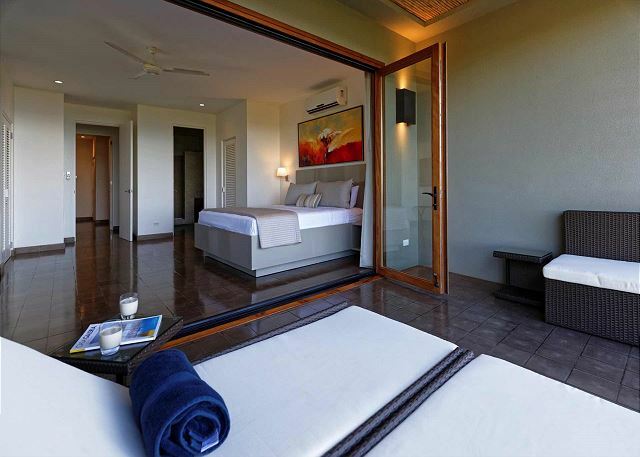 In the spacious master bedroom, sliding glass doors open onto a large private terrace that overlooks the spectacular Pacific coastline. Villa Paradise is designed to sleep 6 adults, and can accommodate 2 additional guests with a queen size aero bed which is available to be placed in one of the bedrooms. Outside, the common area of Villas Las Mareas features a private infinity-edge pool and barbeque area that is the perfect setting for lazy afternoons and unforgettable evenings. As a guest at Villas Las Mareas, you're just a few steps from Pangas Restaurant & Beach Club, an extraordinary beachfront locale where you can lounge on comfy shaded couches or order an elegant meal, all with your feet in the sand. And this is just the beginning of your vacation. 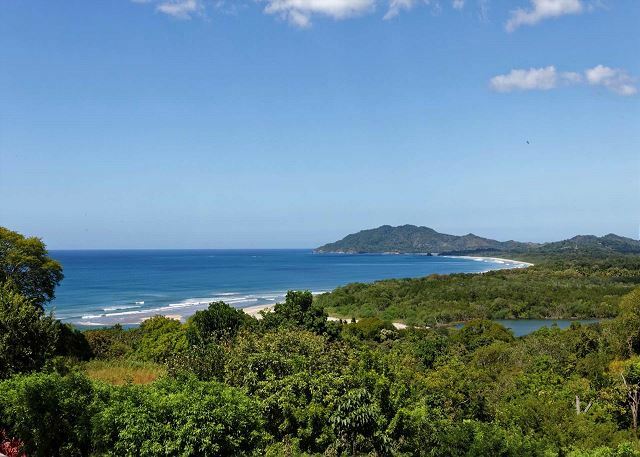 Walk the street or the beach and experience the vibrant energy of Tamarindo, this once-sleepy beach town made famous by its year-round surf, adventure tours and eclectic community. All the excitement of exploring, dining, shopping and nightlife are waiting in your front yard at Villas Las Mareas. Dive into the experience and then retreat to the private tranquility of Villa Paradise where you will feel worlds away from it all. Having the best of both worlds is not only possible, it is waiting now. Perfect location, close to shopping and restaurants but far enough away to be quiet. The Villa was immaculate and has an amazing view. We had one sink problem that was fixed immediatelly. The concierge booked some great tours for us. 5 stars. Kevin, thank you for your comments and happy to know you loved the Villas and its location. It is true that Las Mareas Villa Paradise has an amazing view and glad that you enjoyed it. Let us know next time you are coming back as we love to assist you once again. Pura Vida! Had a fantastic stay at Las Mareas. The place was clean and kitchen stocked with everything we needed. The place had a wonderful view & the location was perfect. If you plan on going into town, you can walk (walking up & down can be a bit much as the hill is quite steep) or rent a car or golf cart. I highly recommend the latter. Thank you Mitchell, we are thrilled to hear you had a fantastic stay at Las Mareas Villas and that you found the villa with everything you needed. Thank you again for staying with us and we look forward to your return. It was the best vacation ever. Cant wait to go back. John & Jill, We are so happy to hear you had the best vacation ever and will love you have you back very soon. Pura Vida! Donna, Thank you very much for your kind review and your positive comments. We are thrilled to know you had the best experience ever during your stay and enjoyed not only the Villas but the area too! It was a pleasure to assist you throughout your trip and we hope you will make Costa Rica a repeat destination. Thank you again for staying with us and hope to see you back here in sunny Tamarindo! We thoroughly enjoyed our stay at Villa Paradise. A modernly appointed condo, the property had all the amenities we desired with a beautiful view on the quiet side of Tamarindo. It was clean and the very well furnished. The kitchen was well stocked with dishes and appliances. We spent our mornings and evenings on the two gorgeous balconies overlooking the beach and estuary. Everyone at Stay in Tamarindo, from Kate and Erin in reservations, to Adriana in guest services, to the concierge Cris, was so helpful and friendly. The villa was close to town and the beach where there were a variety of shops and restaurants. We found the golf cart rental essential to get up and down the hill. Overall, we would stay here again in a heartbeat. Dear Archna, Thank you for your kind words and review! It was our pleasure to assist you before and during your trip. We are so happy to hear you had a great time and enjoyed your stay in Villa Paradise. We look forward to welcoming you back for another round very soon! We've just stayed at this property for the fourth time, and it never disappoints. All of the onsite reservations agents make every effort to assure that your stay is perfect and to assist with any needs that might arise. The resort is gated, private and beautifully landscaped. The rooms themselves are top shelf. All of the bedrooms are gorgeous, with private bathrooms, large flat screen TV's, individual in-room safes and amazingly comfortable beds. The living room is large and open, and the views looking out over the water are spectacular. The kitchen is large and fully stocked, with anything you could ask for, including top of the line appliances. They have spared no expense to make this resort exceptional and well worth the price. We can't wait to return for a fifth visit! Martin, We were so happy to have you back. So glad you had a great time during your visit and could enjoy the condo and the area. Thank you for staying with us again and cant wait for your 5th visit. All the best! 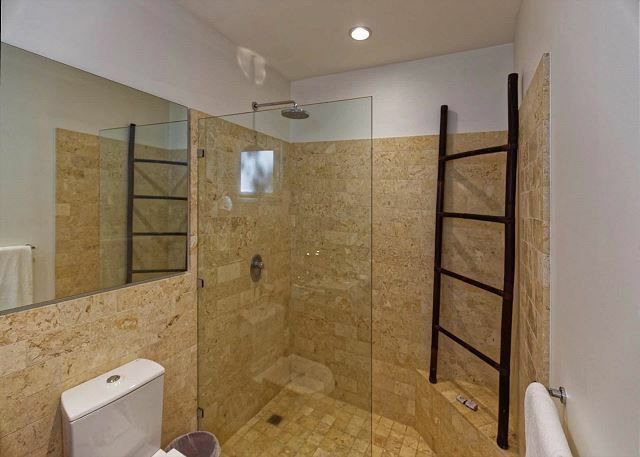 A very clean property with a gorgeous view, well manicured grounds and friendly staff. Most expectations were met. 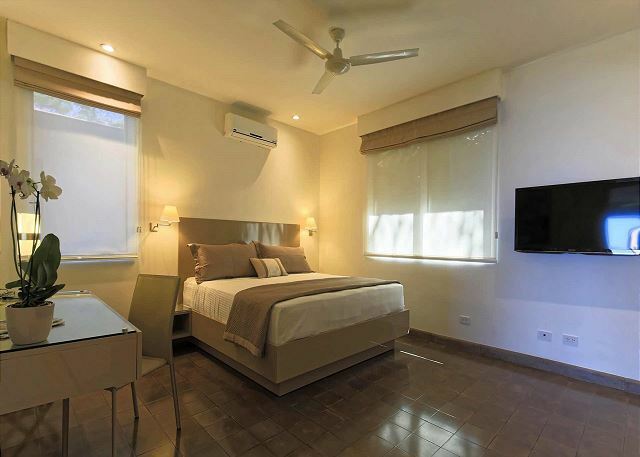 Convenient location just on the edge of the hustle and bustle of Tamarindo. A car or golf cart is required for freedom of access to restaurants and beach locations. We had a bad experience with the golf cart rental company but that wasn't the property's fault. I would recommend someone greet guests upon arrival and answer questions. A packet of info was provided though. Teri, we are glad that you had a good time and enjoyed the Villa and the area. Sorry to hear about your friend misfortune golf cart accident, we hope she has recovered well. Also, regarding your check in, we are glad to have told you that as you checked in on a Sunday, we were going to leave an envelope with instructions to have access to the Villa and do a self check in. Thank you again for staying with us. All the best! Thank you Joshua! It was really nice to meet you and your wife. So happy that everything went well at the wedding. We will be more than glad to help you plan your next stay with us! Pura Vida. We had our wedding group stay at 5 of las mareas villas. It was truly a 5 star experience. Jen, Adriana and Christina made for a very easy process from beginning to end. They were always available and made sure we had whatever was needed. The golf carts came in handy as well in getting groups up and down the hill. We used the pool and grill area for several informal get together that worked out perfectly. We cannot recommend las mareas more highly, the villas and the amazing staff made for a truly unforgettable time. Thank you to the entire stayin tamarindo team- we so appreciate all your work during this special time! Thank you Gina! 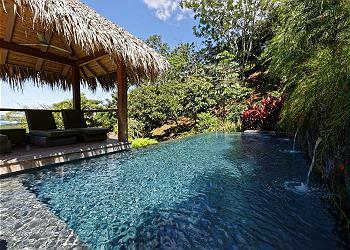 We are thrilled to hear you had a 5 star experience while in Costa Rica. It was our pleasure to assist you before and during your stay! It is true the Villas are the perfect place for big groups, so you can enjoy together as a big family. We hope you enjoyed the rest of your trip in Costa Rica and hope you come back down for a visit very soon. Pura Vida! Cristina Gonzalez, the concierge, was amazing, as was the maintenance man, Carlos, and the cleaning ladies. We had a great experience with the gate guards as well, always very welcoming to us. Everyone was extremely friendly and helpful. Cristina was responsive 24 hours a day, all 7 days and arranged tours, car rides, a chef, and helped us get a golf cart. Our trip went very smoothly because of Cristina. When we arrived and could not get into our safe, Cristina had Carlos come over immediately. When I needed a ride to the market, Cristina sent me the name of a very friendly driver, who came immediately. We had such a great time, we are coming again next year. The Stay in Tamarindo tour guides, Jose and Grayven, were very informative and made our excursions more fun. We met Edwin on our first day, who helped set the positive tone for our entire vacation. Thank you! Thank you Judith! Sounds like you had an amazing time in the Villa and really got to enjoy what this area offers! :-) Glad to hear the great attention from Cristina, she is amazing in what she does and we are really proud to have her in our team! 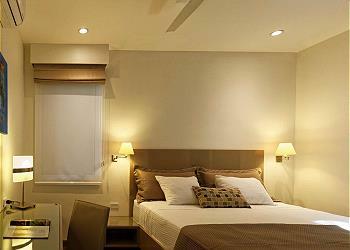 Thank you for staying with us and dont hesitate to contact us next time you are coming back down for a visit. Pura Vida! Our group booked the entire Las Mareas Villas through Stay in Tamarindo () for the week of April 22-29, 2017, and everything about our stay – from beginning to end – was exceptional. We all wish we were still there. Jen of Stay in Tamarindo helped with the booking arrangements and answered all of our many questions with friendly and helpful information. Stay in Tamarindo even arranged for shuttles from and back to the airport in Liberia (Edwin supervised the shuttles and made everyone feel welcome and comfortable). Upon arrival, the Villas were clean and ready for us, and Adriana of Stay in Tamarindo helped us get settled in and took care of everything we needed. 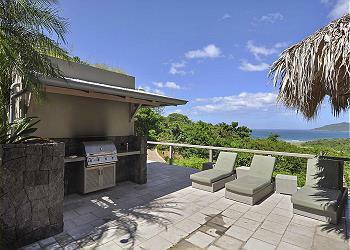 Las Mareas Villas are located on the hillside overlooking the Pacific Coast in Tamarindo. The views are spectacular! 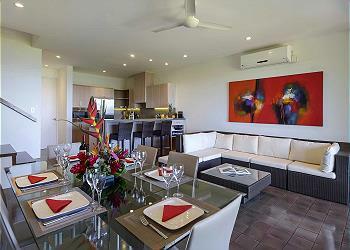 The individual Villas have identical floorplans and are new (constructed in 2013), with all modern appliances (including washer/dryer) and furniture. The beds are very comfortable. Everything is well-maintained. The Villas were cleaned regularly during our stay. The pool at Las Mareas got a lot of use by our group and is in a beautiful setting. Cristina of Stay in Tamarindo provided Concierge Services for our entire group. She arranged tours, transportation, answered questions, offered advice, and generally made our week better. We visited beaches, bars, Rincón de la Vieja National Park (zip-lining, horseback riding, tubing, hot springs), went scuba diving, and took a Safari Boat Tour with up-close encounters with crocodiles and monkeys. 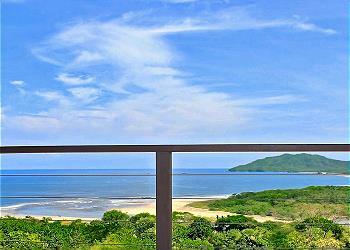 Whatever you want to do or see in Guanacaste can be arranged through Cris. But our favorite was probably the Sunset Sailing Cruise onboard the 82-foot Antares. Wow! Live music (thanks Max!) and truly gourmet food, not to mention snorkeling, dancing on the deck, and an open bar. And, Pangas Beach Club is right at the bottom of the hill for dining and fun all week. Our sincere thanks to all. Tim, Thank you very much! We're thrilled to know everything went great with your trip. The villas really are a perfect location for a group! :-) We loved having your group over and we are so happy to know you and your friends had an amazing time during your stay. Sounds like you enjoyed the tours and activities and experienced a lot of Costa Rica's attractions. So good to hear how much you enjoyed the staff and services provided, it was our pleasure to assist you before and during your stay. Thank you again for staying with us and hope you can come back to sunny Costa Rica very soon! Just could not have been a better place to stay in Tamarindo. I would recommend a golf cart rental to get up and down the hill to town but it was well worth it to get back to the quite of the villa and pool. The staff were fantastic and took care of everything we needed from Airport transportation to tours and in town dinning they were on top of it. Jeff, It was our pleasure to assist you! So glad that you had a great time in the area and the Villa. We'd love to help you plan for another great stay when you're ready to come back down to CR! Thank you again for staying with us!! Our vacation rental experience was absolutely amazing and couldn't have gone any better! Rachel, It's great to know you had an amazing experience :-) We hope to have you back sometime soon. Pura vida! We loved staying at Villa Paradise! The location was just off the main road, the road was very steep to get up. We only walked once to the beach because we have 4 kids (4,5,8,& 9) and it was really tough for the littles to walk up. But the view was amazing! Very clean! No bugs. Very convenient to have the laundry there and loved having the maids come. The pool was absolutely beautiful. 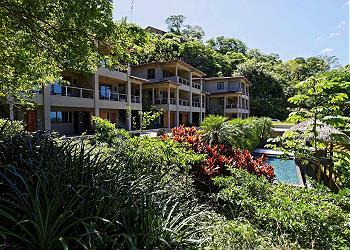 If we come back to Costa Rica Villa Paradise in Tamarindo is where we would go!